North-facing limestone crags that are generally weather proof. There are quite a few good climbs here at various grades, and a lot more climbing to be developed. The Arboretum comprises a set of crags about 60–80 metres high. Much of the rock is un-featured and routes tend to follow the large cracks which break up the cliff. climbs will give you access to the climbs on Gumboot Ledge. For the climbs at Arboretum (right) continue down the riverbed, through the ever-changing mess of logs where a sign stating "Fun Climbing" hung between two trees indicates the start of a marked track. 50m further when you reach a junction, turn left on the trail marked "A2". Take the rock stairs uphill. Squeeze past a tree and you will have reached the wall. The mellow left facing corner crack in front of you is Crackerjack. Intended as the main access route to Gumboot Ledge, but has some good sections despite the vegetated first pitch. Can be combined with Arc Of A Diver for a five-pitch route. Starts on the very left of the crag just after the track first meets the rock, following a wide crack. 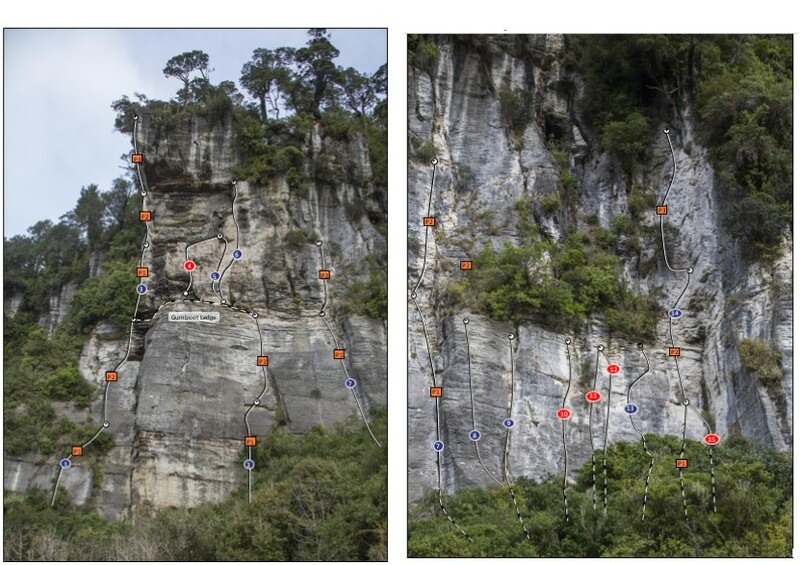 Climb the sloping slab on the right with bridging left across to the arête before engaging the crack. Steep moves past the third bolt to belly-flop on to the vegetated ledge, followed by a repeat performance to gain the belay station. Climb the unprotected crack to the first bolt (could be easier when it cleans up a bit); then up the wide crack with bolts on the right arête. At the ledge move right and climb the face and through a small overlap (crux) to gain a crack. Above the ledge large jugs on the right lead up to a steep finish under the tree on Gumboot Ledge. Lindsay Main, Jack Grinsted, 2008. Starts at a wide crack and corner, with bolts on the left arête. Chimneying, bridging, lay-backing, jamming … all the traditional techniques. Above the chimney is a steep crux, followed tricky jamming to a spacious belay ledge. Unfortunately this pitch is very dirty. Excellent pitch with classic finger crack and jamming. Move right 2-3 metres to another corner and climb the crack to a station on the right, just below Gumboot Ledge. Joe Arts, Simon Courtois, 2008. Fun multipitch with everything from jamming to a jug infested roof. Can be done as a 40m single pitch but you will need to extend the first clip above the DBA. 8m left of Blunt Arete. This distinctive crack is protected by seven bolts. Can also be done on gear now the crack has been cleaned. Climb right and up through a juggy roof. Short but stellar pitch. Descend from the eerie belay station. Clip the first two bolts of Rock Ahoy then wander leftwards up the vague arete. A wide crack 5m right of Black Sheep. A boldery start leads to easy climbing then harder moves above. Fairly well protected but still feels a little wild. Follows the large pillar directly left of Nomad. Place gear in the crack to the left. The upper, more difficult section is protected by four bolts. Finish at the Nomad DBA. On the left of the wall against the vegetation is this handsome hand crack. Good climbing, with bridging and jamming. Climb to a steep crack (crux) then follow the right crack. Step left to a DBA. The climb is accessed from the flagged trail that departs the dry riverbed at the end of the log jam. Follow the cut rock steps to the left and follow the cliff around. The climb starts from a prow-like ledge next to the large left facing corner. Scramble on to a block and step on to the slab, tending leftward. Delicate moves past the third bolt (crux), then up the faint corner with a move on the right wall to gain the limited stance with ring anchors. Continue up an intermittent crack with bridging and some nice fist jams to a steepening but juggy top. Move right to the double ring station in the corner. Climb up & left of the belay through steep rock to easier ground. Pull through two more small overhangs before finishing at a magical & mystical belay. Neil Silverwood , Joe Arts, 2008. Obvious easy crack climb with good gear in the corner, finishing at the same belay station as Neil’s other pitch.